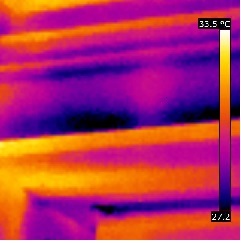 Thermal imaging surveys cleverly highlight areas where insulation is missing or draughts are getting in. 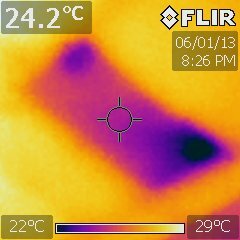 We can then use these images to help you best target insulation measures throughout your household. where a patch of loft insulation has either been missed or moved. As air circulates from hot to cold this missing insulation would mean that the warmth of the house would seep through this patch of ceiling. This also adds risk of moisture collecting on the colder plaster and possibly causing damp. Draughty doors and windows can account for 15% of heat loss from your house. To the left we can see cool air filtering in from behind a window frame. By discovering where these problem areas occur householders can take simple measures to insulate and draught proof their homes, reducing heat loss and lowering bills and CO2 emissions. If you are interested in learning about your home and electricity use, discovering how you could lower your carbon footprint and fuel bills make sure you get in touch with LEG to book your free survey.